Russian Prime Minister Dmitry Medvedev signed agreements on expanding cooperation in industry, railway construction, agriculture and tourism during his recent visit to Thailand. 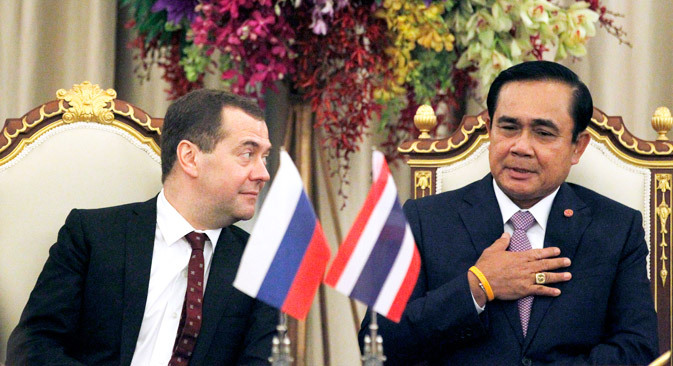 Russia and Thailand plan to increase annual trade to $10 billion by 2016. Prime Minister Medvedev made this declaration during a meeting with the Prime Minister of Thailand Prayuth Chan-o-Cha on April 8, 2015 RIA Novosti reported. "Last year (2014), our turnover grew by almost 20 percent,” Medvedev said. “According to various estimates, it amounts to between $4-5 billion. Positive dynamics remains in place this year, despite the economic difficulties." According to the Russian Prime Minister, the parties must continue to remove trade barriers and increase the level of industrial cooperation. Medvedev's visit was the first official trip of a Russian head of cabinet to Bangkok in 25 years. Ever since the U.S. and Europe levied sanctions against Russia, the authorities in Moscow have been talking about a "turn to the East." Speaking at the Third Moscow Open Innovations Forum in October 2014, Medvedev said that Russia was ready to join forces with the Asia-Pacific countries to create new markets and integrate with high-tech production chains. The Russian Prime Minister's trip to Thailand indicates that the government did not stop at the multi-million dollar gas deal with China and continues to seek economic partners among other Asian countries. Noting that Russia is seeking to expand its presence in the Asia-Pacific region, Prime Minister Chan-o-Cha said that Moscow and Bangkok "need to take a close look at cooperation within ASEAN." Along with the turn to the East, the Russian government is working on large-scale project of import substitution. The termination of import flows from Western countries has already affected many segments of the economy from technology to food products. Russia has set itself the ambitious task of finding resources within the country, but also places high hopes in future partnerships and the experience of the Asia-Pacific region. For Thailand, the reduction in European imports offers a chance to significantly increase its share in the Russian market. "I requested that they consider the question of the supply of natural rubber and agricultural products from Thailand," Prime Minister Chan-o-Cha said. In addition, local companies want to invest in the production of auto parts and food in Russia. According to Medvedev, the parties plan to build new Thai agribusiness factory farms in the Far East. The premiers of the two countries agreed to intensify joint activities in industry. "The first contract for the supply of two Sukhoi Superjet 100 aircraft to Thailand will be signed as early as this fall," Medvedev said. "KAMAZ operates in the region successfully. There are good developments in the fuel and energy complex." The state-owned Russian Railways corporation has reached an agreement on the construction of railway infrastructure and a marine coal terminal on the island of Borneo with the Thai company Banpu Public Company Limited. The corresponding memorandum was signed during Medvedev's recent visit. The Federal Agency for Tourism (Rosturizm) and the Thai government also signed a tourism joint action program for 2015-2017. The Ministry of Tourism and Sports of Thailand is set to significantly increase the number of professional Russian-speaking guides in anticipation of the ASEAN Tourism Forum in 2015. The interests of the parties also include cooperation in science, specifically more interaction between the National Agency for Science of Thailand and the Skolkovo Innovation Center in Russia. Chan-o-Cha noted the importance of the signing of a memorandum between Moscow State Regional University and the Sayam College of Technology in Thailand. "For our part, we intend to continue educating Thai students in the universities of Russia," Medvedev said. Thailand is one of Russia’s oldest trading partners and 2017 marks the 120th anniversary of the inauguration of this relationship. Arguably trade relations with Thailand have never seen as much interest from Russia throughout their entire history of cooperation than they have over the last year.